Rattlesnake display at the SB Museum of Natural History. I grew up peering into this same display. Okay, confession time. I took Waits to the zoo. Once. It happened one time. Because, see, I grew up going to the zoo each and every single Friday, and I can’t help but partially attribute my love of animals to that experience. So unlike many vegans who were clear about their anti-zooness from the start, I was not. I was conflicted. Okay so story time. I grew up in California in the 80s, which means I grew up learning about THE CONDORS. Maybe if you’re not a California 80s baby you won’t be familiar with this story, but basically this incredible bird with like, a 10-foot wingspan, was seriously endangered due to human poaching and pollution. And by endangered I mean, they were literally extinct in the wild. There were less than 50 alive, all in captivity. It was horrible and tragic and as we grew up, we all followed along with the recovery process. We were all so invested in seeing this species survive! And they did survive, and in the early 90s the condors were released back into the wild, and with careful management they have been steadily growing in numbers ever since (though they’re still on the endangered species list). So anyway, I was walking around this zoo with my father and my son, and generally feeling a lot of mixed emotions (nostalgia! . . . I love the pretty animals! . . . that pretty animal looks bored out of his mind!) and then all of a sudden, I found myself standing in front of a condor enclosure. Right there in front of me, for the first time in my life, I was seeing a real live California condor. And I have to tell you, I got choked up. And I stood there in awe, thinking about how close they had come to extinction and how it’s sort of a miracle that now there was this enormous gorgeous raptor sitting right there in front of me, alive and not at all extinct, and yes I am a sap, and yes I let a few tears slip out. It was pretty overwhelming. And then that giant bird took off. She leapt from her perch, and spread those mighty wings, and flapped once, twice, aaaaand three times got her to the other side of the enclosure. Three flaps and that was the complete extent of her ability to fly – this birds of prey that were she free would soar in lazy sweeping circles hundreds of feet above the canyons. And my heart broke for her, and then more tears came, and that was the end of my zoo patronage right then and there. So I know, you may be getting ready to tell me that there are some zoos out there that are good. It was, in fact, the San Diego Wild Animal Park, in partnership with the LA Zoo, that facilitated the program to bring the condors back from the brink of extinction. And I concede, that it’s possible there are animal parks out there doing good work. Sure. But then I have to ask, what’s really the point of breeding condors just to spend their lives in tiny cages? Cages which deprive them of their basic rights to act on their natural instincts and urges (such as soaring, and hunting)? That day at the zoo I also came across a big beautiful lion trapped in a small cement box. I saw a crocodile floating in a pool not much bigger than my bathtub. I saw instance after instance of animals looking sad, wilted, clipped, or crazed. And wouldn’t you be, too? So no, no zoos for us anymore. That became clear. But luckily, there are alternatives! 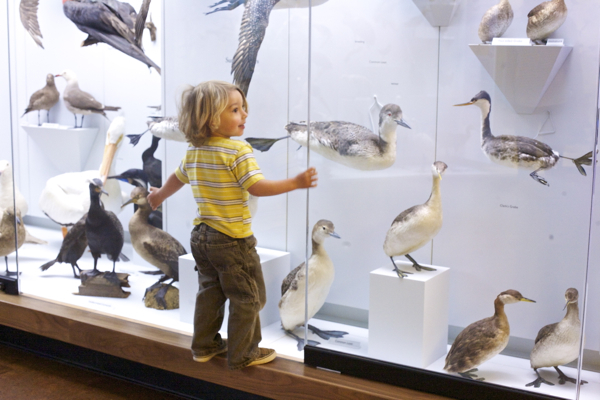 A Natural History Museum is just exactly what it sounds like – a museum which focuses on the natural world. This includes zoology, botany, paleontology, ecology, and much more. 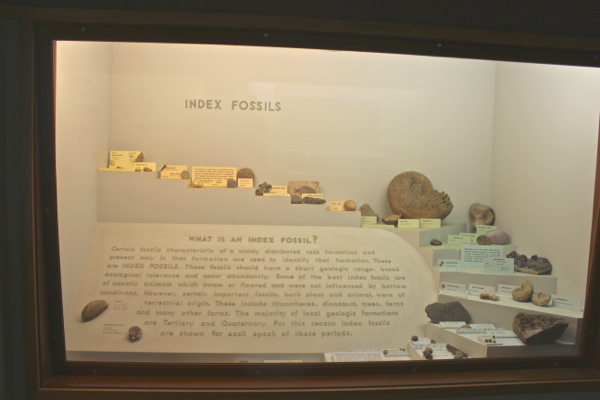 There are generally no living animals on display at Natural History Museums. Instead they use replicas, models, and taxidermied specimens. Yes, it’s taxidermy. And I can see how this would bother some vegans on a purely visceral level. However, it helps me to remember that Natural History Museums – at least the one here in Santa Barbara – do NOT actively kill animals for use in their displays. The animals are donated after they’ve died. I interned at the museum during college, and I’ve literally seen people bring in road kill, or call when something unusual washes up on shore. There’s an incredible, enormous, complete blue whale skeleton that sits in front of the museum, and it came from a whale which was found beached and deceased back in 1980. 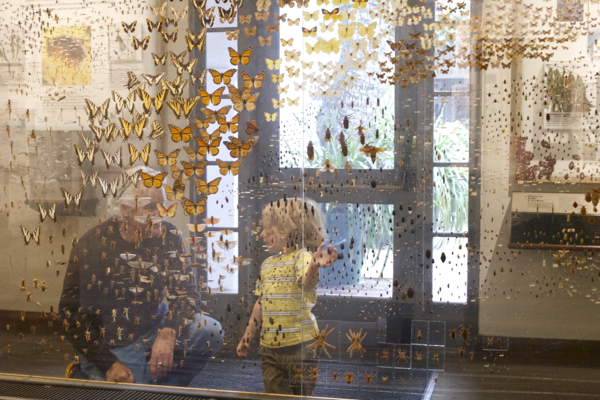 This sets museums apart from zoos. Zoos participate in an active machine of animal oppression: capture and confinement. In contrast, museums provide a passive vehicle for education. 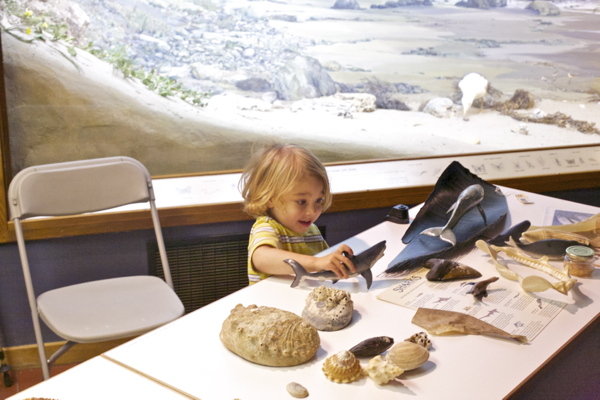 Natural History Museums familiarize children with the biological world by allowing them to view representations of animals in their natural habitats, to interact with zoological artifacts, and to begin their exploration of the Earth sciences. Waits and I visit the Natural History Museum pretty regularly in the fall and winter. He adores it, and always finds something new to discover. And I love watching him there. The way he studies the animals. The way he delights in the interactive displays. His questions! I do not believe that children need zoos in order to fall in love with the animal kingdom. Because I watch my own child do it right here, each time we visit. There are a couple other places we go to appreciate animals, places which offer great alternatives for vegan children to learn. I’ll be sharing some of our very favorites soon, so stay tuned! Also, I just want to reiterate, it makes me SO sad when zoos get lumped together with Sea World and even circuses sometimes. The place I work is a non-profit and our main focus is on appreciation of wildlife and on educating the public on matters of conservation. My only intention with bringing up AZA was to suggest it as a first-step weed-out process (i.e. don’t visit some little non-AZA “zoo” that some wacko who collects exotics set up on his own). I have not seen Blackfish yet, but really want to. I have friends who used to volunteer at Shedd, and this movie will surely give us a lot to think and talk about. I have never been to a water show at an aquarium, so I know it will open my eyes to things I’ve willfully ignored. Is it crazy that I’m looking so forward to it? I certainly wouldn’t be excited to watch a documentary on the circus industry. Yay, glad I could help Jessica. That’s funny that you’d considered emailing me! And wow, it must have been so amazing to see a Condor in the wild. I hope to see that some day too! I want to learn more about the Safari Park. Can you tell me what made you sad? were the enclosures still too small? Was it all very “Disneyland-y”? I remember going once as a kid and have wondered about taking Waits some day. Admittedly I have done NO research so far, haha. Yes! I’m reviewing some vegan wines and will be writing about the issue of alcohol very soon! Oh that must have been heartbreaking. I think wild animal sanctuaries are a great alternative, it’s awesome that you have one close to you! Absolutely! We visit farm animal sanctuaries a lot, but wild animal sanctuaries are great – I just wish there were more of them. I think for me, the biggest distinguishing factor is that “zoos” are for profit, while “sanctuaries” are non-profit. For me that makes all the difference. Oh man, great point and one I wasn’t even considering! I am so looking forward to it too! I’ve avoided a lot of those types of docs, but I agree for some reason this one seems extra exciting. I think it seems especially well-made. I can’t wait! See to me – and this may be just a semantic issue and I may be using the words incorrectly – but the profit issue is pretty much everything. A non-profit exists to put animals and their welfare first, while a for-profit institution always exists to put the bottom line first, because they have to. That’s what I always say about “happy” “humane” cage-free eggs for example. That once you’ve commodified an animal, put a price on them in any way, then you will always have to put their interests secondary to the money. So anyway, in my mind, a zoo is a place that exists for human entertainment, and animals happen to live there. Whereas a sanctuary is a place that exists for animals to live safely and happily, and people happen to go there. It’s possible that we agree more than we realize, and are just using the word “zoo” differently. Because from the little you described here, I would consider where you work to be a “wild animal sanctuary”, which is not what I’m referring to when I speak of zoos in this post. I look forward to the email. No rush! It’s definitely a zoo where I work but also a non-profit and I do believe, as you say, that the welfare of the animals are put first and that people just happen to go there. But without visitors, we wouldn’t have the money to pay for the animals’ diets, medical needs, and for exhibit upgrades, so yes we do charge admission and people do enjoy coming to see the animals. But we also donate hundreds of thousands of dollars of that money that we bring in to conservation work around the globe (much of which the public is never aware of, and yet we do it anyway because it truly is the animals and their environment that we care about). I think we offer suffer from the fact that the mission of zoos has evolved greatly since the early 1900s when entertainment of the public was the goal, whereas now it is conservation and education. I think this touches on what gets me upset a lot of the time, because just because we charge admission, we are seen as a place of entertainment. Anyway, we’ll talk more later. I think it will be helpful for both of us. I especially want to hear from the outside perspective what the main issues are that are perceived as negative. Thanks for you honesty and openness. This is why I love your blog, right here. 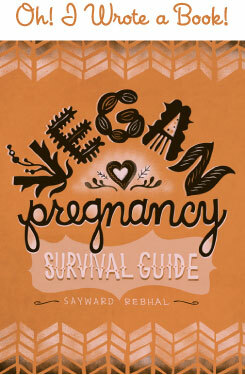 It is the only vegan blog I’ve ever found where I can read everything, get some amazing healthy ideas, and not feel judged or like a bad person for NOT being vegan myself. On the contrary, I tend to leave your blog feeling supported for the healthy or ethical decisions I do run with. We visit our local zoo as it is very nice and has some of the largest enclosures I’ve ever seen in a zoo and is always clean, but EVERY other place I’ve lived the zoo was a one-time thing after seeing pathetic, unkempt animals stuck in very small enclosures looking miserable and the whole place reeking of excrement and I just couldn’t bring myself to ever go back to those zoos. Seeing the animals so mis-treated takes the fun out of things. Aw, thanks lady, that means a lot. I really work to make this space safe for everyone, and I’m so glad to hear that non-vegans feel comfortable here. Love it! Also, email coming at you soon! This is a bloody fantastic post Sayward. I will be sharing it with people who don’t understand why we don’t go to zoos. You have explained it so well. Thank you. I’m having a hard time understanding how a person can walk into a zoo and dismiss it based upon touchy-feeliness without doing any research on its inner workings. 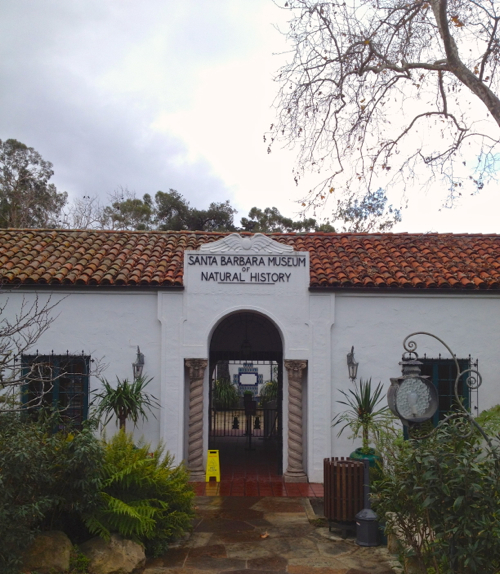 The Santa Barbara Zoo that you have written off is a non-profit. The condor exhibit that made you so sad is part of a much larger conversation project that goes far beyond this description you provide. It is in actuality a very respectable undertaking considering how it facilitates the work being done on the islands. And that concrete lion box? Please research the breeding history that has allowed many lions to transfer to other institutions in the overall mission of conservation. It is disheartening to me when real good that is being done is missed. Especially when a simple trip to their website would point to all of this information, including the accredidation process of the AZA. Thank you for writing about this. 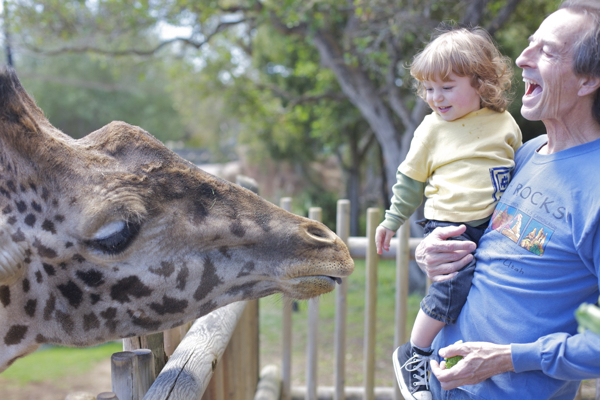 As a mom, and new vegan, it can be difficult to reconcile zoo-going family traditions with a new belief system. My name is Gergana Alekova and I am a student at the Multidimensional Tourism Institute (MTI), University of Lapland, Rovaniemi, Finland under the supervision of Senior Lecturer José-Carlos García-Rosell (jgarcia@ulapland.fi, Tel. +358 40 484 4190). I am contacting you regarding my thesis entitled “A vegan perspective on animal-based tourism services: Thematic analysis of blogs”, which I am currently writing in the context of my Master’s degree in Tourism, Culture and International Management. I myself have been vegan for almost 4 years now and my personal experiences and perspective led to a desire to explore how vegan consumers express their ethical considerations regarding animal-based tourism services. For this study I approach vegan consumers as representatives of the changing values and opinions within society regarding animal rights and welfare. Ultimately, the goal of this research is to shine a light on vegan consumers and their demand for ethical animal encounters within the tourism sector. My hope is that this research will open up the discussion regarding unethical practices on the part of animal tourism providers and will inspire academics as well as businesses and entrepreneurs to work towards a more ethical development of the tourism industry. The study I am conducting focuses on public vegan blogs as a source of data. I have identified 2 blog entries on your platform Bonzai Aphrodite that I would like to incorporate into my research data; “Why Don’t Vegan Children Go To The Zoo? Also, There Are Awesome Zoo Alternatives! 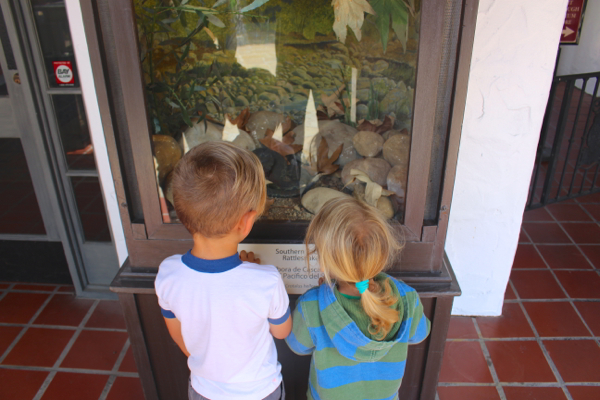 #1 – The Natural History Museum” and “Awesome Zoo Alternatives For Vegan Children! #2 – Animal Sanctuaries”. The result of the study will be published as part of my Master thesis. The data that originates from your blogs will be used exclusively for research purposes and will be presented anonymously so neither your name nor the name of the blogging platform will be mentioned. However, the study incorporates some direct quotes from your blogs which might be traceable using online search engines. The research follows the principles for responsible conduct of research dictated by the Finnish Advisory Board on Research. Your participation is voluntary so please contact me if you DO NOT consent to the use of your blogs as research data. Also, please feel free to contact me if you would need further information regarding the study and/or the use of the research data.